As kids grow, they have this fascination with making different objects. Whether it is their creativity or imagination at work, it helps to nurture this interest and allow them to develop. It can be about art or science, depending on where the kid’s interest lies. For those who like both, this Invent A Stellar Solar Light kit may be something worth trying. The Invent A Stellar Solar Light kit allows kids to build their own solar-powered light. The kit comes with a solar light device as well as a variety of materials and tools that kids can use to create or invent their own solar lamp. It also comes with an Inventor’s Guide to help the kids get started. 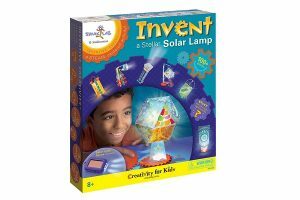 The Invent A Stellar Solar Light kit can help kids develop their creativity as well as imagination while trying to build something functional. This activity can help kids develop their spatial reasoning skills, problem-solving as well as their critical thinking skills. The Invent A Stellar Solar Light kit is ideal for kids from 8 years old and above. It is available at Fat Brain Toys for $18.